Sorry, there are only 2100 tickets of that type still available. Sorry, there are only 2100 tickets left for this event. 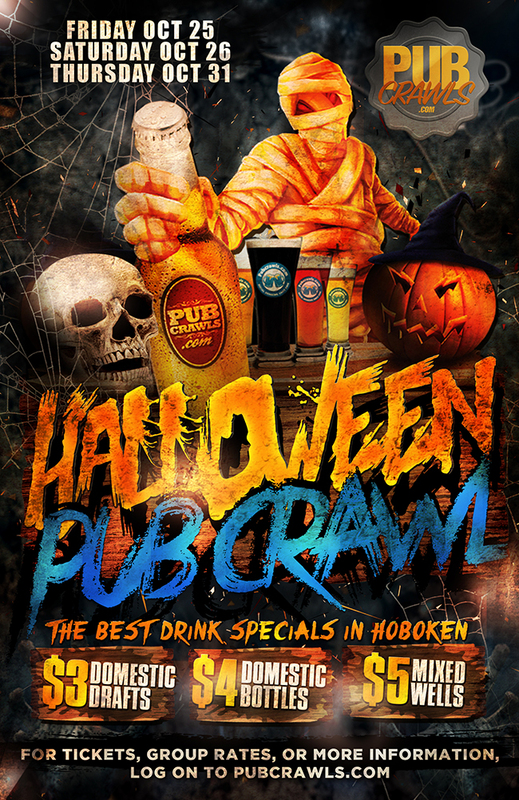 Access for 1 (one) to the Hoboken Halloween Pub Crawl events on all 3 days. Access to ALL participating venues. Access for 1 (one) to the annual Hoboken Halloween Pub Crawl on Saturday October 26. Access for 1 (one) to the annual Hoboken Halloween Pub Crawl on Thursday October 31. Everyone thinks they know all about Hoboken. Let me take a stab at this. When Hoboken pops up into your head you think Frank Sinatra, sixth borough, or kind of New York City, but not really. But you, my good sir or madam, do not truly know Hoboken. Hoboken is truly a hidden hotspot when it comes to bars, lounges, and late night entertainment, and on Halloween Hoboken becomes THE hotspot in North Jersey. As the producers of the world's largest pub crawl, it's fair to say that we know a thing or two about a good bar scene, that's why we've decided to host our next massive event in Hoboken on one of the most anticipated days of the year - Halloween! Not sure about the pub crawl option for Halloween? Imagine, if you will, the world’s most interesting people, in killer costumes, crawling through Hoboken with Manhattan as your backdrop, having awesome drinks and an even more awesome time. I know, this sounds way too dope, but this is the Hoboken reality. You may have already been invited to same lame Halloween party by now, but why bother going to same lame party when you can crawl throughout Hoboken with your friends having a legendary time? This year, we have once again added only the hottest bars with even hotter people in Hoboken. With HobokenHalloween.com, you will gain free access to over ten venues with special discounted drinks to boot! Now top that with the best party crowd in the tri-state and you’re looking at a fright night combination! With three days of pub-crawling in Hoboken, this year will surely not disappoint. While crossing the river to Manhattan may be appealing, the atmosphere and community vibe of true Hoboken residents cannot be understated. This is an enclave of nightlife right under our noses. There are plenty of holidays throughout the year for getting together with friends and drinking, but how many of those days are you expected to dress up like whoever or whatever you want to be? This is the perfect opportunity to seize the moment and explore the annual HalloWeekend pub crawl in Hoboken. Participating venues include Texas Arizona, Cadillac Cantina, Madd Hatter, The Shannon, Green Rock, Willie McBrides, Ainsworth Social, and more!